A real couch-potato, on tablets for diabetes and hiding away because she had no confidence to go out! Now she’s a new person – always out-and-about, walking, swimming, wearing fabulous clothes – and no tablets and no sign of diabetes! 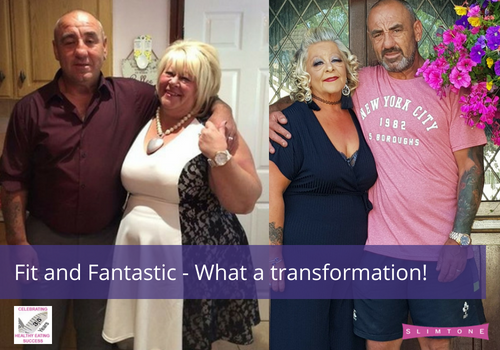 Sharon has lost an amazing 8 stone and feels fantastic. Her husband David has lost 7½ stone too. What an amazing achievement. Sharon says the secret to her success is planning and preparation. Find out more about the difference Slimtone has made to her lifestyle, click here. If Sharon can, you can too!